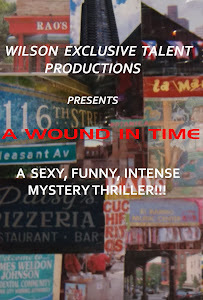 A WOUND IN TIME: PRODUCTION OF THE FEATURE FILM IS ON THE CALENDAR FOR 2014! PRODUCTION OF THE FEATURE FILM IS ON THE CALENDAR FOR 2014! Feb/March-Staged reading of "Silk Stockings and a Bible"
May-Rehearsals for "Silk Stockings and a Bible"
June-Showcase Production of "Silk Stockings and a Bible"
July-Staged reading of "Wild Child"
August-Exteriors for "A Wound In Time" the feature film, Rehearsals for "Wild Child"
October/November-Rehearsals and 2 week run of entire trilogy "Women You Thought You Knew"